When it comes to your dog, safety is extremely important. That’s why so many dog owners get a dog seat belt to secure their pet in their vehicle. Dog seat belts can be extremely useful and offer just as much protection as a seat belt does for a human being. While you hope that a car accident never happens, the best way that you can protect yourself and your pet from getting injured if one does happen is by securing everyone with a seat belt. The problem is, it can be difficult to choose the right car seat belt for a dog. That’s why we have come up at this buying guide to help you know what to look for and choose the right one, as well as give you some recommendations on specific dog seat belts to get. Let’s take a look at the top five dog seat belts on the market right now. These seat belts are really safe and have lots of different features, and they will work with many different breeds from Rottweilers to Yorkshire Terriers. If you are looking for a great seat belt for your dog, and any of the five listed here will do the job. What exactly is a Dog Seat Belt? The first is this 2-pack adjustable seat belt from Vastar. There are a couple of things that make this really unique among car seat belt models for dogs. The first is that two different straps come with this. That is an important point because you want to secure your dog as well as possible, and one strap isn’t as safe. If you have one strap attached to a seat belt in your car, they still have a broad range of movement and can get injured in an accident. But when you have them secured with two anchor points, if you have to slam on the brakes for some reason, they are going to be a lot more protected. Of course, you should always use these seat belts with a dog harness and never with a dog collar, because of the choking hazard. 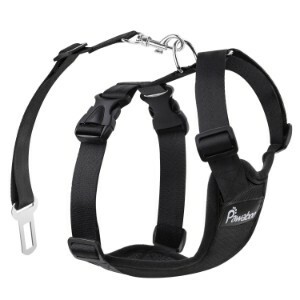 Most of the harnesses that are out there have a couple of different attachment points. For example, one may be on the front and one may be on the back. This is the perfect type of harness to use with these dog car seat belts, because you can attach them to different ends of your backseat and secure your dog directly in the middle. This limits their movement to a very short distance and protects them in two ways if you have a sudden stop. The other great thing about this particular car seat belt for dogs is that it is adjustable. So, if you have a larger dog, or your dog needs a little bit more freedom of movement then your backseat seat belts are providing, then you are able to extend the straps to give your dog that movement. On the other hand, if the straps are too long and your dog could fall to the ground in the event of a sudden stop, then you can shorten up the straps so that they are much more limited in how far they can fly forward. This really is an innovative idea, but you have to get the right harness and it is going to be sold separately. OMorc makes this next seat belt, and it is actually pretty similar to the first one. There are couple of advantages that this particular car seat belt offers that the first one does not and a couple of disadvantages as well. The first thing that you need to know is that this is best suited for smaller dogs. You can probably secure a medium-sized dog with this seat belt, but you may want to avoid using it for medium-large or large dogs. Of course, it goes without saying that extremely large or active dogs such as Golden Retrievers or Labrador Retrievers and larger breeds are probably not suited for this car seat belt. The same goes for German Shepherd dogs. This works the same way as the previous one, and it comes with two straps so that you are able to secure your dog properly in the backseat. The problem is that the straps are pretty thin compared to the first entry on the list. They are still made of nylon, so they are plenty strong, but it is more to do with the wear and tear of the strong dog pulling at them then the risk of them failing during an accident. They just are not going to stand up under a great deal of pressure over time. Some of the features with this dog seat belt include quality nylon fabric, straps that extend from 19 inches to nearly 28 inches, perfect for small and medium dogs, wide compatibility with seat belt clasps which means that they will fit most vehicles and durable solid zinc alloy hardware. Just like the first one, the straps can be set at whatever length you want securely and give you a wide range of options when it comes to placement of your dog in the backseat; and they will attach to a harness in two different places to anchor your dog securely in the backseat. From Pawabook, this dog safety harness is set up a little bit differently than the other seat belts that we have discussed so far. This is an actual harness that fits around your dog and is secured to the seat belt clasp in your vehicle to keep your dog restrained. There are a couple of things to keep in mind when it comes to this particular model, and like the others on the list, it has both advantages and disadvantages. The first thing that you need to know is that you have a lot of options when it comes to size. This seat belt for dogs comes in small, medium, large and extra-large. The second thing you need to understand is that there is a single strap that ties into your vehicle seat belt clasp. It works the same way as the other ones on the list, but instead of having to straps that are buckled on both sides of your backseat, you would be securing your dog on one side or another or in the middle of your backseat. This does not give quite as much security as the ones with two straps, but this dog seat belt harness has the advantage of being specifically designed to fit comfortably and distribute pressure if you happen to slam on your brakes. If you get one of the other seat belts that include just the straps, then you’ll have to get a harness separately and it may not be designed specifically for seat belts. This is a very durable dog seat belt made out of nylon with excellent hardware that is made to last for a long time. It has a D-ring on the back of the harness where the seat belt actually attaches, and you can unsnap and unsnap the seat belt in seconds so that you can take your dog out of the car and attach a leash. This is a terrific dog car seat belt, where the only disadvantage really is that you do not get two anchor points to secure your dog but instead just one. The strap is adjustable so if you need to give your dog more room or less room to move you can. Plus, this harness comes in 10 different colors. Friends Forever is the brand name behind this car seat belt for dogs, and it can be used with just about any breed you can think of including pointers, Bulldogs, French Bulldogs, poodles and beagles. Just like when you get your dog an outdoor dog kennel, dog bowl or automatic dog feeder or any of the other accessories out there, you want to go as high quality as possible because you want the best for your dog. Whether you are shopping for a dog house, dog playpen, regular dog bed or indestructible dog beds, you want to make sure that what you’re getting is quality and that is exactly what this car pet seat belt provides. This one is similar to the first two that we reviewed, where there are two straps that you attach to your own harness and then buckle them into the seat belts in your backseat. There really aren’t a whole lot of differences between this dog car seat belt and those, but there are a couple. For one thing, this is a one-size-fits-all which will allow you to choose between 20 inches and 32 inches in length. This is also really easy to snap and unsnap to both the car seat belt buckle and to your dog’s harness. These dog seat belts are comfortable and high quality, and your dog will be able to sit down, lie down or stand up in the backseat of your car and still be protected in the event of an accident. The clasps and buckles on this car seat belt are a little bit more heavy duty and durable than some of the others that we have discussed here, but the nylon material is pretty much the same. This is a quality car seat belt from a great brand that is going to keep your dog safe as long as you use it properly. Finally, this car seat belt harness from Way-Seven is another harness and seat belt combination that is specifically designed for use in cars. The good news about this dog car seat belt is that it comes in four different sizes so you are sure to find the perfect size for your dog. You get to choose from small, medium, large and extra-large. There are also three different colors to choose from. Just as a guide, the medium-size is for and 10 to 14 inch girth, suitable for pad swaying between 11 pounds and 33 pounds. In all other respects, this works exactly the same way as the harness and seat belt combination reviewed above. However, there are a couple of differences. The price is absolutely perfect on this, and one of the major advantages to this particular harness is how lightweight it is. Your dog will barely feel it, and with the Oxford fabric and polyester mesh lining, it is comfortable and soft against your pet’s fur. This is an adjustable top-rated dog car harness and some of the advantages with this include lightweight mesh lining with sponge padding that your dog will love, extremely adjustable straps that give you plenty of freedom and allow for a custom fit so that your dog is as safe and comfortable as you can make him, and completely covered by 100 percent satisfaction guarantee and terrific customer service. This is a really great brand and a very good product that will keep your dog safe while riding in the car. You have to decide for yourself whether you want to harness for your dog that is already included with the strap, or you want to go with the straps and choose your own harness. But this harness is exceptionally strong and designed so that the impact of a crash will be distributed evenly, giving your pet a better chance of surviving or not getting injured in the case of a minor accident. This is definitely a recommended product, as are the other options that are listed here. In order to know what to look for in the best pet seat belts, you have to understand all of the different factors that you should weigh when it comes to buying one. Because there are so many out there on the market, and so many different types to choose from, it can be pretty challenging to find the right adjustable dog seat belt. This guide was designed to give you all of the right information, which will allow you to make your own decision and buy the perfect car seat belt for your own pet. However, that starts with understanding what the factors are that you need to consider, and how much each one matters. For example, you need to get the right size for your dog, as well as determine whether you are going to choose a car seat belt with the straps only or if you’re going to go with a full-fledged harness that has the strap or straps attached. You also have to determine color and style, although this is less important than determining adjustability and various other factors. This buying guide should give you a great deal of information about how dog seat belts work and how you can choose the best one. You can always go with one of the reviewed products above, but if you want to choose your own, this guide will help you narrow down your choices to only the best. So, what exactly is a car seat belt? The car seat belt is a device that secures your dog to the regular seat belt buckles in your car, usually in the backseat, keeping them secure in case of a crash. If you were to get into an accident and your dog was simply sitting on the backseat without any sort of restraints, there is a good chance that they could fly through the windshield or hit the dashboard and get injured. A car crash can be very serious for dogs, because they are a lot smaller than humans. Even a minor crash can be a major risk. But a dog seat belt protects your pet and keeps them anchored to the seat that they are sitting in even if an accident happens. Imagine that you are driving along and you have to slam on the brakes suddenly to avoid hitting a pedestrian or another vehicle. A dog car seat belt will simply keep your dog in their seat and possibly save their life. It is very much the same way as human seat belts. The difference is in the way that car seat belts for dogs work. 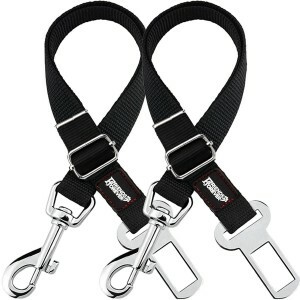 They are usually either straps that connect to your dog’s harness and fit into the seat belt buckle with the other. 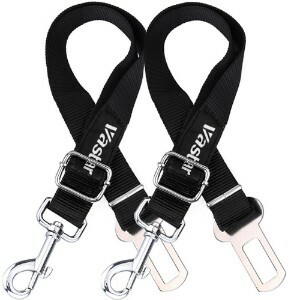 Often, there are two straps together so that you can secure your dog at two different points. There are two basic types of dog car seat belts. 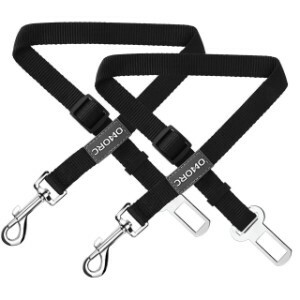 The first type is the simple strap that connects to any dog harness or dog collar with the other end fitting into a seat belt buckle. These are usually fairly short, with an easy to unfasten snap at one and that you can use your thumb on, while the other end is universal to fit into almost any seat belt receptacle out there. These straps are almost always adjustable, and will connect almost any harness out there to your backseat seat belts. The advantage of going with the straps by themselves is that you are able to choose your own harness, and they usually cost less. This is especially useful if you already have your own harness. The other type of dog car seat belts out there is the harness and strap combination. The disadvantage of these is that you’re going to pay about twice as much to get both the harness and the strap. Another disadvantage is that while most strap only seat belts come with two straps to secure your dog at two different points, harness is often only come with one strap. 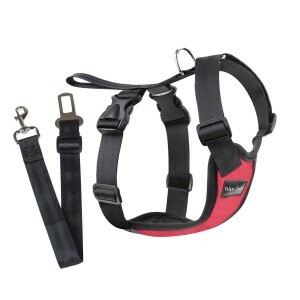 The advantage of going with the harness is that they are made for using in conjunction with seat belts and distribute weight better than some of the other harnesses out there. Plus, they are often adjustable because you want your dog to be secure. What about carrying your dog in a dog crate instead? This is certainly an option, but there are actually some pretty compelling reasons not to. Many people think that their pet is going to be safer in a crate if they were to get into an accident. Unfortunately, that is simply not true. Your pet can get thrown around easily against the hard walls of a crate if you are involved in an accident, even something as minor as having to slam on your brakes. This can lead to broken bones and head injuries, even resulting in brain damage. The Center for Pet Safety has crash tested dog crates and found that only a couple of them met safety standards that would protect your pet in the event of a crash. On the other hand, putting your dog in a harness that is specifically made for seat belts and securing them to a couple different anchor points in your backseat keeps them immobile if a crash happens and doesn’t allow them to bang up against hard surfaces that can cause an injury. Because the force is distributed over the entire body of your dog, pet harnesses are much safer than crates – especially if they are made to work with seat belts and have been tested for stress and safety. One of the things that you will have to consider when it comes to transporting your pet is the law in your particular state. Most states do not have any particular law though when it comes to how you transport your pet. They do not require pet seat belts, crates or harnesses in order to bring your pet with you somewhere. However, that is not the case in New Jersey. In New Jersey, you can get fined up to $1000 for allowing your dog to ride unrestrained. That means that you either need to have them in a crate or you need to have them in a harness that is secured with seat belt straps. There is one more law that you want to be aware of when it comes to transporting pets. In some states, if your dog rides in the bed of your pickup truck, then you have them secured properly in a crate that is anchored to several points to keep it immobile. This is true in the states of Rhode Island, Oregon, Minnesota, New Hampshire, California and Connecticut. Of course, laws may change at any time, so it is always useful to check with your state to find out what the laws are presently. The material that your best dog harness for car is constructed from is important. Of course, most of the materials out there are going to protect your pet in the case of a crash. But this is not something you want to guess on. That’s why you normally want to go with reinforced nylon and top-of-the-line materials when it comes to choosing a dog seat belt. You can tell when seat belt straps or a dog harness is low quality and has the potential to break or come apart during the crash. The straps will be thin, the hardware will be cheap and the stitching that holds everything together will be pretty light. You want the opposite though. You want at least two-ply nylon material to make up the bulk of your dog harness and almost all of your straps. The interior material can be softer because it is going to be against your dog’s skin and you want them to be comfortable. You also want thick hardware that looks high quality, instead of flimsy snaps and then seat belt inserts that could easily slip out in the event of a crash. The material that you choose for your dog harness and seat belt is just as important as the other factors like size and type. How easy the seat belt is to use should also be something to consider. You don’t have to struggle when it comes to putting your dog into the backseat of your car and getting them secured by the seat belt. It should take you only a second to snap one end of the seat belt strap to the harness and into the seat belt receptacle. The reason for this is not to save you time when you or loading or unloading your dog, although this is definitely a benefit, it is so that you can easily unsnap your dog if there is some sort of accident or mishap where they have to be released quickly. After all, your own seat belts have their push button features that allow for the same thing. There is a reason that they are set up that way, and your dog seat belt should be set up exactly the same. In addition, you want your dog harness to be easy to slip on and off unless you are planning on your pet wearing it permanently. You don’t have to release at a moment’s notice as long as you have a clasp that connects the harness to the seat belt, but you should be able to take it off easily for cleaning or if you are not traveling with your dog and you want to put the regular dog collar back on them. Here are some additional tips that cover both the purchase and the use of a dog seat belt. These are things that you need to know when it comes to buying the right seat belt and some tips that will help you when it comes to using it properly. You want to have as much information as possible before you buy, and you want to make sure that you are strapping your dog incorrectly and doing everything you can to make him or her safe. Check Safety Ratings: Make sure that you check the safety ratings that come with your dog harness and or dog seat belt strap. In either case, you want to be aware of the safety ratings and testing that has been done on your particular harness in straps. The problem is, there is not much regulation regarding pet seat belts, and no real oversight agency. There have been some independent studies that you can check, but your best bet is to research each individual manufacturer that you are looking at purchasing from and find out what their standards are. Check Customer Reviews: You should also check customer reviews when it comes to dog seat belts. Customer reviews will tell you all kinds of stuff when it comes to a crash tested dog seat belt. Seat belt for dogs reviews will also inform you as to how durable the harness is, and how well it fits certain breeds of dogs. You may be able to avoid a situation where you have to return a harness because they do not fit your specific dog. Plus, you will learn a lot more about strength and durability by reading the customer reviews. Introduce Your Dog to the Seat Belt Slowly: If your dog is not used to using a car seat belt, then you may want to introduce it to him slowly. You do not want your dog freaking out on a long trip because you buckled them into a seat belt that they feel claustrophobic and. That’s why it is good to introduce your doctor the seat belt and take very short rides until you see how he or she is going to react to it. It might be useful to have someone actually riding in the backseat with your dog so that they can give him or her comfort when they feel anxiety from being buckled in. Change Size As Needed: If you have a growing dog, then you might have to change size later on. Make sure that you are paying attention to how the harness fits and whether the seat belt strap gives them enough room or too much room. For fully grown dogs, this probably won’t be a problem, but if your dog is still a puppy, then you might have to upgrade to a larger size harness or longer straps later on. There are other vehicle accessories for your dog that you should be aware of. For example, you can combine your dog seat belt with a dog car seat cover, or with cooling pads for dogs that you can put on the seat to keep your dog cool while in the car. This may not be necessary if you have air conditioning, but it can be useful because dogs have a harder time cooling down than humans do. Cooling vests for dogs are another option. You may also want to have a dog food container and dog food inside of it when you’re traveling. This will allow you to feed your dog his regular food without having to resort to table scraps or buy something from the store whenever you want to feed your pup. There are travel accessories for dogs that extend far beyond the dog seat belt, and you have a lot of choices out there. When it comes to choosing the best dog harness for car use or the best dog seat belt 2018, there are many options to choose from, but there are just as many options when it comes to accessories like the ones listed above. The bottom line is that there are plenty of things that you have to think about when it comes to choosing the right dog car seat belt. You have to decide first whether you want to choose your own harness or whether you want to get a harness that is already included with the straps that connect to your seat belt. You also have to make sure that the seatbelt clasps themselves are going to fit with your existing receptacles. From there you have to worry about things like size, style, color and whether the harness that you’ve chosen will actually fit your dog or whether the straps that come with it are long enough or short enough to keep your dog on the seat and secured in the case of an accident. The good news is, with the information in this guide you should be able to choose the right seat belt for your dog and with all of the different options and considerations that are listed here, you will be able to make an extremely informed decision when it comes to choosing your next dog seat belt. There are a lot of options out there, but this dog seat belt guide will help you narrow them down so that you can always choose the perfect one.